A roadside bomb destroyed a police vehicle patrolling in a dangerous area of southern Afghanistan on Monday, killing all seven policemen on board, an official said. The Ford Ranger police truck was traveling through the Zhari district of Kandahar province when the bomb exploded, said provincial police chief Fayed Agha Faqid. Zhari was the site of one of NATO's largest-ever battles and remains a dangerous region. Military officials said they killed between 500 and 1,000 Taliban insurgents in Zhari last fall. Elsewhere in Kandahar, NATO troops opened fire on a motorcycle that soldiers thought was a possible suicide attacker, NATO's International Security Assistance Force said. It said the driver of the motorcycle was injured but that there were no other casualties. 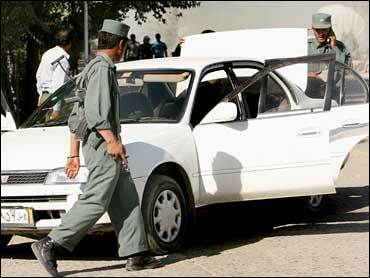 However, Izatullah Khan, a doctor at Kandahar's main hospital, said the NATO forces killed one man and wounded three. "I was riding a bicycle when the NATO convoy was passing, and when they got close they started firing and I was hit," said Mohammad Naimat, who was recovering from a bullet wound at the hospital. "There was no explosion, no fighting. I don't know why they started firing." Civilian casualties caused by NATO forces have been an ongoing issue for the international military mission here, and there have been several cases of military convoys firing on motorists that soldiers felt represented a threat. Over the weekend, Afghan officials said 45 civilians were killed during a NATO and U.S.-led coalition bombing in neighboring Helmand province. President Hamid Karzai, who has repeatedly asked international forces to take better care of Afghan lives, sent a six-man team to investigate. A U.N. tally shows that of civilian deaths this year, 314 were caused by international or Afghan security forces, and 279 by insurgents. A similar Associated Press count, though lower, shows the same trend: 213 killed by the U.S. or NATO and 180 by the Taliban — excluding the most recent violence. Overall, the AP counted more than 2,800 people killed this year. The tally, based on data from Western and Afghan officials, puts the violence far ahead of last year, when about 4,000 died.